How quickly can I get my driving licence? Contact us now and you could have your licence within a week? SUPER Fast Track driving test bookings done online while you are on the phone with our client managers. 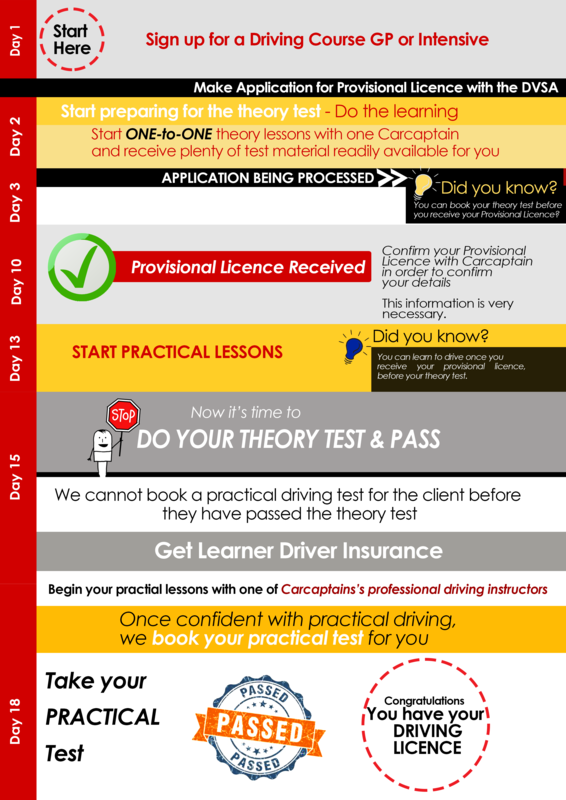 Why Carcaptain – because we are the Best Intensive Driving Course London ~ Read all about it here. If you already have done your theory test we can probably get you through the course in 5 (five) days from the time of first contact. If you still need to do your theory test it will take a little longer. From the day of registration for your provisional driver’s license until you pass your test ; 19 to 20 days. If you already have done your theory test we can probably get you through the course in five days from the time of first contact. Once you have registered with us we will immediately send out artificial intelligence theory course material to you and book you in for a one-hour, one-on-one, theory tuition. This is subject to you putting down a deposit for your pending driving course which will include your Fast Track theory test and driving test bookings. Fill in the DVLA D1 form for application of your provisional driver’s license. At the time of writing it takes approximately 10 to 14 days for you to receive your provisional licence. The moment you have received your provisional licence we will do a fast track theory test booking for you. This can normally be achieved with in 2 to 3 days after you having received your provisional licence. As soon as you receive your provisional licence we can start your driving course. As soon as you have passed your theory test we will be able to book your practical driving test. Normally we will be able to book you a practical driving test between 3 to 7 days after you have passed your theory test. During this whole time, from the time you received your provisional licence you will have been busy learning to drive on the road. If you submit your application for your provisional driving licence on day one, and the DVLA are satisfied with your application form, then you should receive your provisional driving licence 10 days later. Assuming we can find you a suitable theory test, which is highly likely, you will be setting your theory test 2 to 3 days after having received your provisional licence. It is imperative that while you were waiting for the provisional driving licence to arrive that you have been doing adequate preparation for the practical theory test. You will then attend the practical theory test, and pass it (provided you have done sufficient preparation) and we will be able to book you a driving test between three and seven days after you having passed your practical theory test.